After a week of protests, unrest, riots, and violence, the relative calm in Baltimore is a welcome peace. Although many people are taking the time to address deeper social problems that predated the protests and riots last week, some are still stirred up by the action, and any injustice could set it off again. Then, Fox News falsely reported a Baltimore police shooting Monday. The network soon corrected the report, but it was already all over the Internet. As he was running away, an officer drew his weapon and fired. Tobin reported that the man shot was a "young black male," a characterization that brought immediate ties to the reason for the recent unrest in Baltimore — claims of police brutality against young black men. Since the retraction was issued only minutes after the initial report, the news did not have much time to spread. Rather, it was Fox's retraction that made headlines. 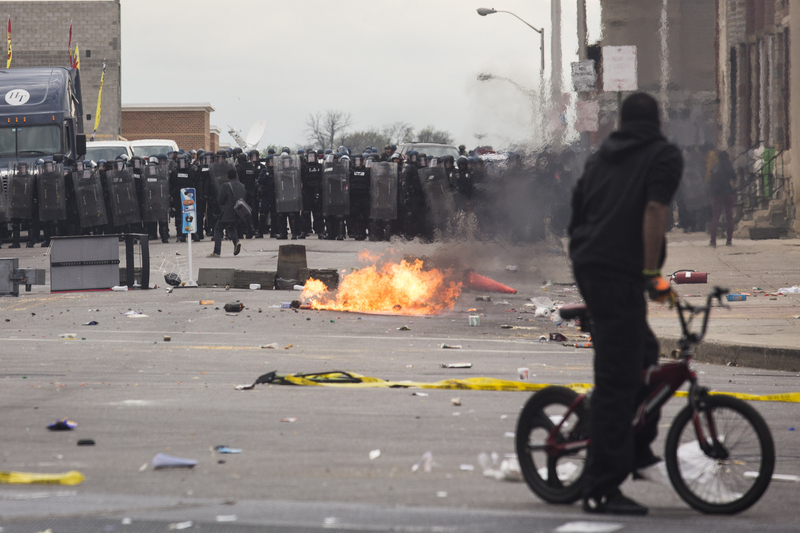 But some locals in Baltimore said the scene was chaotic and adversarial between citizens and police. After police denied that the shooting had occurred, anchor Shepard Smith apologized (in a way) on air for the mistake, which was incredibly dangerous considering the current volatility and tension on the streets of Baltimore between police and protesters. An article on Fox News' website does not say that the shooting did not happen, but rather says there have been "conflicting reports." Here is the original video from the newscast, which was shown live on Monday afternoon. Tobin claims that the man was running away from police when he was shot multiple times in the back. Eyewitnesses have also claimed they saw the same thing. As is becoming increasingly common nowadays, locals also videotaped the scene after the reported shooting, which was chaotic and unclear. Though police have denied that the shooting occurred as Tobin described it, they confirmed that a civilian with a handgun had been arrested in connection with the incident. Police said the man fired a gun, but he was not shot, nor was anyone else at the scene injured. Although police say the man was not injured, he was taken to the hospital "out of an abundance of caution." Mike Tobin would never say something that he thinks to be untrue. I've worked with him long enough, worked with all kinds of people. Mike Tobin would never, ever, ever do that. What's happened is we screwed up. Our people on scene were wrong. Theirs was an error that was honest and straightforward and our duty as journalists is not to make mistakes. And when we make mistakes we are duty-bound to correct them immediately and as clearly as possible. Many people on social media were surprised that Fox News would report on a police shooting that never happened, considering the network's history with covering police shootings. Critics claim Fox covers incidents of police brutality with not only neglect to racial factors, but outright denial and even racism, as Mother Jones reports. One Fox article even claimed that people were "making it a racial issue" after Michael Brown's death in Ferguson, as if there were not an underlying racial problem. In the volatile situation that is Baltimore after the death of Freddie Gray, you would think the last thing any reporter or producer would do is report any act of violence, particularly a police shooting, that it had not absolutely confirmed and vetted several different ways. But that's just what happened Monday afternoon. The largest message from the error and retraction of Fox's story is one of skepticism. Though there are reporters videotaping and police making official statements, the plain truth of what's happening in Baltimore may not even be clear to those who are there.